This GPS unit is one of more than 50 that researchers have planted in the Greenland bedrock to measure ice loss. Researchers in the Greenland GPS Network, led by Michael Bevis at The Ohio State University, have discovered that the same hotspot that feeds Iceland’s active volcanoes has been causing scientists to underestimate ice loss on Greenland. Photo of the highest region of the Narsarsuaq glacier in southern Greenland by Dana J. Caccamise II, courtesy of The Ohio State University. Researchers at The Ohio State University and their colleagues have discovered that the same hotspot that feeds Iceland’s active volcanoes has been causing them to underestimate ice loss on Greenland. Photo of Zachariae Isbrae in northeast Greenland by Anders A Bjork, courtesy of The Ohio State University. COLUMBUS, Ohio—The same hotspot in Earth’s mantle that feeds Iceland’s active volcanoes has been playing a trick on the scientists who are trying to measure how much ice is melting on nearby Greenland. According to a new study in the journal Science Advances, the hotspot softened the mantle rock beneath Greenland in a way that ultimately distorted their calculations for ice loss in the Greenland ice sheet. This caused them to underestimate the melting by about 20 gigatons (20 billion metric tons) per year. That means Greenland did not lose about 2,500 gigatons of ice from 2003-2013 as scientists previously thought, but nearly 2,700 gigatons instead—a 7.6 percent difference, said study co-author Michael Bevis of The Ohio State University. “It’s a fairly modest correction,” said Bevis, the Ohio Eminent Scholar in Geodynamics, professor of earth sciences at Ohio State and leader of GNET, the Greenland GPS Network. The Earth’s crust in that part of the world is slowly moving northwest, he explained, and 40 million years ago, parts of Greenland passed over an especially hot column of partially molten rock that now lies beneath Iceland. The hotspot softened the rock in its wake, lowering the viscosity of the mantle rocks along a path running deep below the surface of Greenland’s east coast. During the last ice age, Greenland’s ice sheet was much larger than now, and its enormous weight caused Greenland’s crust to slowly sink into the softened mantle rock below. When large parts of the ice sheet melted at the end of the ice age, the weight of the ice sheet decreased, and the crust began to rebound. It is still rising, as mantle rock continues to flow inwards and upwards beneath Greenland. The existence of mantle flow beneath Greenland is not a surprise in itself, Bevis said. When the Gravity Recovery and Climate Experiment (GRACE) satellites began measuring gravity signals around the world in 2002, scientists knew they would have to separate mass flow beneath the earth’s crust from changes in the mass of the overlying ice sheet. “GRACE measures mass, period. It cannot tell the difference between ice mass and rock mass. So, inferring the ice mass change from the total mass change requires a model of all the mass flows within the earth. If that model is wrong, so is the ice mass change inferred from GRACE,” he explained. Models of this rock flow depend on what researchers can glean about the viscosity of the mantle. The original models assumed a fairly typical mantle viscosity, but Greenland’s close encounter with the Iceland hot spot greatly changed the picture. To the GNET team, the 7.6 percent discrepancy in overall ice loss is overshadowed by the fact that it concealed which parts of the ice sheet are most being affected by climate change. The new results reveal that the pattern of modern ice loss is similar to that which has prevailed since the end of the last ice age. Computer models can give a good estimate of mantle flow and crustal uplift, he said, and GNET’s mission is to make those models better by providing direct observations of present-day crustal motion. That’s why the GNET team includes GRACE scientists and earth modelers as well as GPS experts and glaciologists. The team used GPS to measure uplift in the crust all along Greenland’s coast. That’s when they discovered that two neighboring stations on the east coast were uplifting far more rapidly than standard models had predicted. He added that the discovery holds big implications for measuring ice loss elsewhere in the world. For instance, GNET has a sister network, ANET, that spans West Antarctica. It employs roughly similar numbers of GPS stations, but spread out over a vastly larger area. Unless more stations are added to ANET, anomalous rates of uplift may go undetected, Bevis cautioned, and analyses of GRACE data will lead to inaccurate estimates of ice loss in Antarctica. 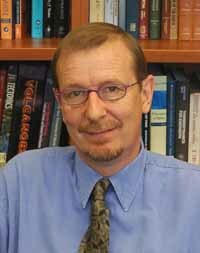 The authors of the paper included Shfaquat A. Khan and Per Knudsen of the Technical University of Denmark; Ingo Sasgen and Veit Helm of the Helmholtz Centre for Polar and Marine Research; Tonie van Dam of the University of Luxembourg; Jonathan L. Bamber of the University of Bristol; John Wahr (now deceased) of the University of Colorado; Michael Willis of Cornell University; Kurt H. Kjaer and Anders A. Bjork of the University of Copenhagen; Bert Wouters and Peter Kuipers Munneke of Utrecht University; Beata Csatho of the University at Buffalo; Kevin Fleming of the GFZ German Research Center for Geosciences; and Andy Aschwanden of the University of Alaska Fairbanks. GNET is an increasingly international project led by the USA, Denmark and Luxembourg. It is funded by the U.S. National Science Foundation and by the governments of the partner nations.